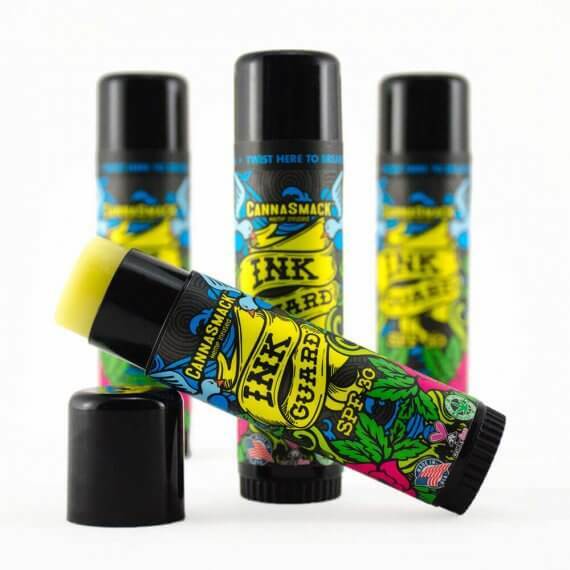 CannaSmack Ink Guard provides UVA & UVB protection for your ink, and helps minimize color fading when exposed to the sun. Our CannaSmack Ink Guard SPF 30 sticks are enriched with premium Cannabis Sativa (Hemp) Seed Oil and feature a light and silky formulation that moisturizes your skin. The easy to use stick applicator allows you full control over your Tattoo coverage. Inactive Ingredients: Beeswax, Coconut Oil, Sunflower Oil, Cannabis Sativa (Hemp Seed) Oil, Aloe Vera Leaf Extract, Vitamin E Acetate, Vitamin E.
Active Ingredients: Oxybenzone (5%), Octinoxate (7.5%), Meradimate (5%), Octisalate (5%). CannaSmack is proud to be a member of the Beauty without Bunnies program by PETA and guarantee that all our hemp lip balms are 100% cruelty free. We are proud to guarantee that our lusciously smooth hemp lip balms are made in the USA from our design department to manufacturing & distribution. Hemp seed oil is rich in Omega-2 and Omega-6 Essential Fatty Acids, along with Vitamins A, E, D, & B. Our hemp lip balms will leave your silky smooth. There is SO much to love about the CannaSmack Ink Gaurd SPF30 tattoo fade shield! For starters the packaging is amazing! So cool and really reflects the tattoo culture. The slim tube makes for easy application yet is slim and easily transferred from pocket to bag! It’s shape also lends to the ease in which you can apply coverage on yourself, as you contort to try to get that shoulder blade (lol) The ink guard itself has a super light yet refreshing scent and applies in a rich, supple smooth fashion. The packaging has plenty of the tattoo fade shield inside and for the price is a remarkable deal! I’m covered in tattoos and don’t see myself running out any time soon! Makes for a perfect gift also for the tattooed loves in your life! Highly recommend and will purchase again! New to the tattoo scene! I take years to make sure I get the right tattoo for me so when I do I take extra care of my skin/the area! This product has helped a lot so that I don’t really need to think about it too much, just apply and go!